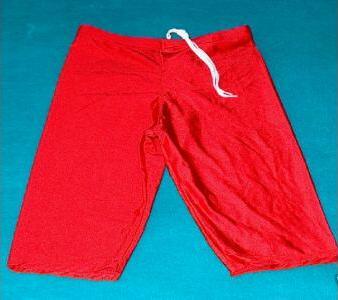 These deep red XSNY shorts I won at an eBay auction in 2004. Seller was xptrader, and it was given this description at the auction: Red workout Nylon Shorts - These shorts have no inner lining, with a draw string like cycle shorts. Offered new. Material 80% Nylon 20% Lycra (very sensual feeling) Soft and Silky, Size Large, Colour Red, photo does not do them justice.